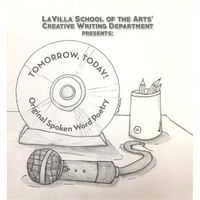 Original Spoken Word Poetry performed by 8th Grade Creative Writing Department at LaVilla School of the Arts. From silly to serious, these original spoken word poems are performed by the 8th grade authors who wrote them. Tomorrow, Today! Features students from the Creative Writing Department at LaVilla School of the Arts in downtown Jacksonville, FL. LaVilla is a public, magnet middle school for the performing arts and these professionally recorded mixed and produced tracks by James Dorsey Music Group (Jacksonville) will make you wonder why we don’t listen more than we do to the young around us. I found this CD while on here searching for something cheap that I could slip into my car and listen on the way to work. I've always enjoyed listening to poetry and so when I found this, I was amazed by how well these were written, and it shocked me even more to know that these pieces were made by teens. This group of kids are talented, deep, and funny, and I hope they never stop writing!